Given a directed graph with n nodes. If there is an edge from u to v then u depends on v. Our task is to find out the sum of dependencies for every node. The first line of input contains an integer T denoting the no of test cases. Then T test cases follow. 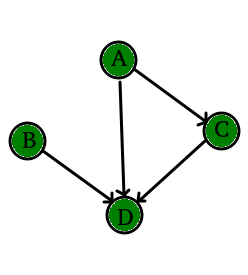 The first line of each test case contains two integers N and E denoting the no of vertices and edges of the graph. Then in the next line are E pairs u and v denoting an edge from u to v.